If you weren't aware, the Christmas holidays are on their way. The minute you see the Coca Cola advert on the television every year signals the beginning of the festive period. This is something that my little brother and I stand by and every time we see it we get more than a little excited. 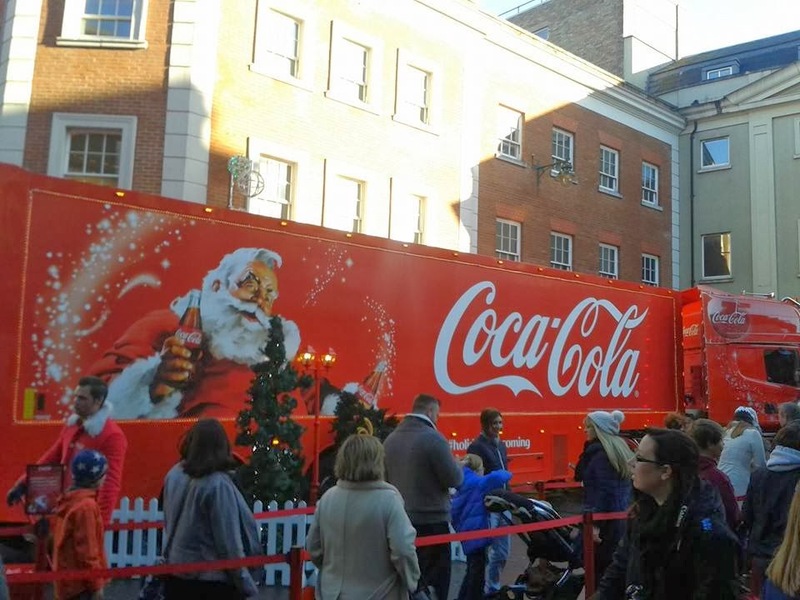 I have always wanted to see the Coca Cola truck but it has never come to a town near me…. until this year!!!! I screamed rather loudly when I found out that the Coca Cola truck would be visiting Canterbury, so last weekend we braved the rainy weather and made a dream of mine come true. I was more than a little impressed with the small choir singing the 'holidays are coming' song and yes I was singing along. I also have to admit that we cheated a little. The queue to have a photo taken next to the truck was extremely long and as much as I love the Coca Cola truck, I wasn't willing to wait with all my children to have my picture taken. And now that it is Christmas Eve, the holidays really are coming and I just cannot wait. Is anyone else excited?? Do you know I never know the Coca Cola Lorry was real! Had it been coming to Cornwall I would love to see it too, something very Christmassy and magical about that music. Hope you are having a lovely Christmas time and thank you for sharing on Country Kids.